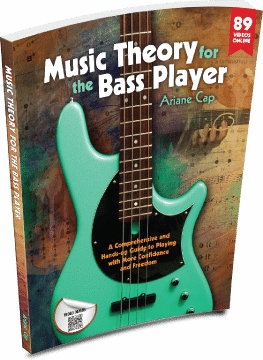 Home / Music Theory for the Bass Player / A Melodic Minor Key With Three Sharps…? Let’s talk melodic minor for a second. It is a beautiful scale. It is the natural minor scale (AKA the sixth mode of the major scale, aeolian minor) with the raised sixth and seventh scale degrees. In classical theory it makes a difference whether you ascend or descend… ascending means sharpening the 6th and 7th, but the descending melodic minor scale is the same as the aeolian or natural minor scale. Sharpening of the 7th scale degree in a minor scale is a big deal. If you sharpen that 7, you create a strong pull to the root on top: that half step below the root just pushes into the root much more forcefully than the whole step below. Hence, when we descend, we use the whole step, no more sharpening, no more need to pull to the top. This pulling to the top note is called “leading tone”, by the way. A G F E D C B A (A to G – whole step!) descending. So, leading tone is one reason, but there is another reason! But if we raise the 7 we get G#, hence an E7 chord! E7 has the tritone! It has the leading tone! If I now go from E7 to A min -> It sounds like we are used to it from the major scale, like a real resolution, the G# happily resolving to the A! In modern music styles we have long abandoned the need to make the distinction between ascending and descending – we use the tonal material of the melodic minor in a variety of ways in modal music, jazz, pop, you name it. Wait, you said to raise the seven to get the leading tone, so that explains the raising of the 7, but why raise the 6, too, then? A B C D E F G# A.
F to G# is an augmented second. This scale is called the harmonic minor scale. It ascends and descends the same way and is widely used, including in ethnic music. But to smoothen out this gap the sixth was raised also. There are lots of uses. You can create modes from both the harmonic minor and melodic minor scales and write melodies and use it for chord progressions. You could say each time you have a minor context and the V chord is a dominant chord, you are in a melodic or harmonic minor field. More on that in another blog post. Melodic Minor with three sharps? I got asked a wicked question on quora. Maybe a trick question, but definitely a tricky one. Read my answer, which reveals more on the melodic minor scale. If you cannot see the text box in your browser, click here. A B C D E F# G# A (G# to A- half step!) sounds happier especially on the piano.